How to make painted OSB look halfway decent? What's the secret to painting OSB so that it doesn't look like painted OSB? It doesn't have to be great, just not so cheap-looking. Well, if it's got to be OSB, and assuming it is for indoor use, skim coat it with drywall joint compound and sand smooth... then prime and paint. The secret is buying sanded, maple, or birch ply. There is no way to make a rough surface look good. It's like how to I take a piece of crap and turn it into gold... you just can't do it. 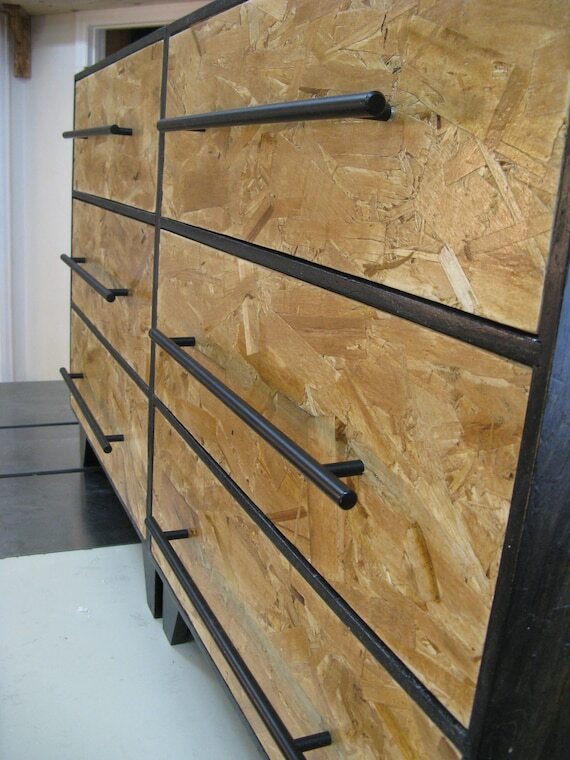 OSB is an awful material in my opinion. It rots real quickly, it doesn't hold nails or screws real well. It's been misused by builders over and over. My slate floor was laid on top of it... The builder was an idiot. Pretty much how I feel about OSB as well. As a builder, I will not use OSB for sheathing or roof decking, period. Indoors or outdoors? If outdoors stucco. If indoors a hopper gun and mud. I should have been more specific. Outdoor. But as Mike says, maybe I should just use a decent ply. Considering it is used for sheathing and is glued up wafers... you would think it does well outdoors. But I have found it rots fast, blows up when water gets into it... (considering it's mostly glue I don't understand that).... Also I think the sun will cause it to fail if not treated. I can't be sure, but I have seen OSB turn black and just flake away, my suspicion was sun and heat.. but it could have been for other reasons... I'm not sure... so I don't consider it a good outdoor wood, without protection. What is the old saying about making a silk purse from a pig's ear? The secret is to NOT paint OSB, only stain, BLO, or clear poly OSB. Cover it with Masonite first??? Or just put siding on it. Aluminum or vinyl, or even hardy-board or Masonite hardboard siding. ANYTHING looks better than a 4'X8' straw bale. uld just use a decent ply. It was going to side my solar wood kiln, so maybe the heat inside (polycarb onate surface plus painted black inside) makes the material even less desir able if heat affects its structural properties. I'm going to put the kiln b ehind the garage where it's not going to be seen very often, but I still do n't like the look of painted OSB even back there. My materials list calls f or 5 sheets of 4x8, so I'm looking at an additional cost of about $50.00 if I use good plywood. Anything will rot when it stays wet. Wood building material aren't supposed to stay wet. I'm curious, when's the last time you used it? I have it in my shop and it holds screws great! Especially those Spax screws designed for particle board. In my opinion, no ply product holds nails well and they shouldn't be used when screws are available. Well the house was built in 87 and that's the OSB I've primarily worked with and been frustrated with. Although I have a few sheets of OSB in the basement, that I am waiting to use on some garbage project. I got it for $1 and figured if I ever need a shipping crate it would be the tkt. Those are some of the ugliest examples of "furniture" I've seen in my life. And I've been to Ikea. James Hardie Fiber/Cement Siding: Opinion On ? Help: Best lawn sprinkler for city life? Anyone know of good uses for old 2-liter bottles? Will T-88 work to glue a piece of clear plastic to PVC? Decent footpump with reliable pressure gauge? Lap joint on end of 2x4? OTish: Teenager repulsion - ultrasonics? How to make painted walk non-skid?